The developer of a blog called Logic + Emotion recently published the following list of books that influence him, along with the picture above. This tells us a little about what a marketing specialist does and thinks about, and a lot about this particular person. 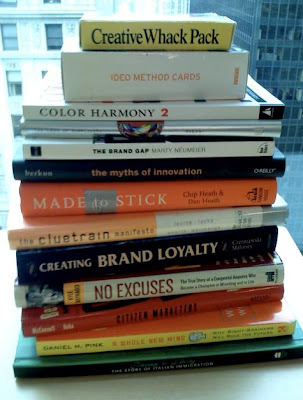 Since "personal branding" will be a theme for us, I will ask you to make a similar stack of books, and show how this relates to your own brand. A while back [a friend] asked me if I could share "what's in my bookstack". Well, it's not just books—but here are a few paper products that I reference on a fairegular basis. Passage To Liberty An well-designed book that reminds me of my heritage and the things that my parents faced as Italian immigrants. It helps me to remember where my roots lie. A Whole New Mind An enlightening piece that reminds me to use all the parts of my brain on a daily basis. Citizen Marketers One of the most comprehensive books on what the "prosumer" movement is really all about. No Excuses The story of Kyle Maynard, a boy born with no arms and legs who became a champion Wreslter. A reminder that I have no excuses in life. Made To Stick One of my favorite reads on how to make ideas memorable. The Myths of Innovation A great way to look at innovation as a process. The Brand Gap One of my all time favorites. A must have for anyone looking to bridge the worlds of design and branding. The Laws of Simplicity An interesting read that lays out how complex simplicity really is. Color Harmony Something I reference when looking to communicate with color. IDEO Method Cards A wonderful source of inspiration for the creation or mashing up of different methodologies. Creative Whack Pack The "Anti IDEO Method Cards", I use this as a counterbalance to IDEO's cards. The Whack Pack is less about methods and more about good old fashioned inspiration.